Animal-friendship stories are plentiful, but this one is an unusual pairing of characters. When Dove asks Yak, “Do you ever wish we were twins?” Yak answers, “No, Dove.” Dove persists, citing all of the nifty things they could do, like wear matching clothes, invent rhyming names, live in the same house, and eat an equal number of cupcakes. But the nice possibilities soon turn into carping. 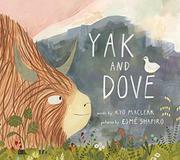 Yak calls Dove “ill-mannered,” and Dove calls Yak “smelly,” and just like that, they are no longer friends. “Lamenting,” Yak tells Marmot of this newfound need for a friend, so Marmot holds auditions for a talent show. Wolf’s declared the winner, but it’s Dove who wins back Yak’s heart. Friends again, they make a quiet garden together. Watercolor, gouache, and colored-pencil illustrations dramatize the differences in the characters’ sizes and add touches of whimsy, often in the form of the lightly anthropomorphized animals’ attire. Yak likes footwear (kids will especially like the four high-top sneakers in one vignette); Dove wears the occasional tiny accessory; Wolf wears a blue tutu and bra. The text is entirely delivered in a question-and-answer repartee (individual types for each character) that both moves the story along and maintains the characters’ gender ambiguity. Still, agreeable though it is, it lacks the charm and characterization of such standards as Frog and Toad.